What is ChronoMaster – what can you do with it? 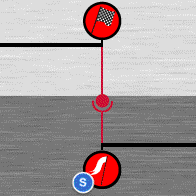 In a “Special-Stage (SS)”, a predefined distance has to be covered in the specified time with each 1/100 or 1/10 of a second deviation resulting in penalty points. Start/finish of Special-Stages (SS) is usually measured by light-barriers or pressure-hoses. Simple Special-Stages (SS) consist of just one sector of e.g. 70 meters to be covered in 9 seconds. There are, however, complex Special-Stages (SS) that can be made up of several interlaced sectors. 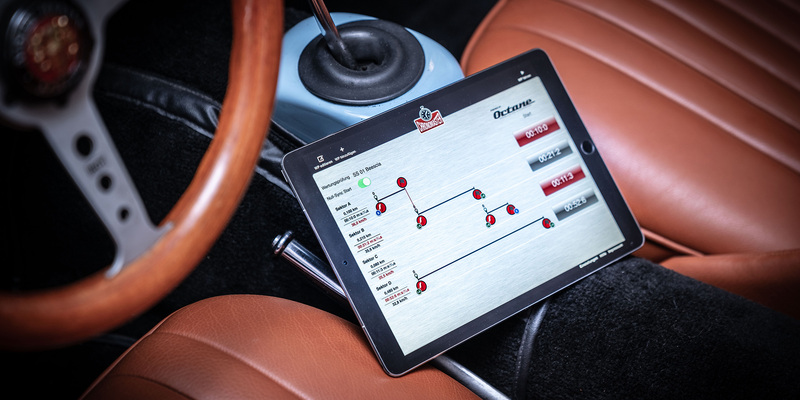 With the help of ChronoMaster you can now easily transfer Special-Stages (SS) from the roadbook to your iPad, save and access during a rallye for relaxed driving. No matter how complex the SS may be. Including a precise 10-to-0 audio-countdown, ability to constantly monitor the correct average-speed of the SS. This way, even hidden average-speed controls can easily be managed. 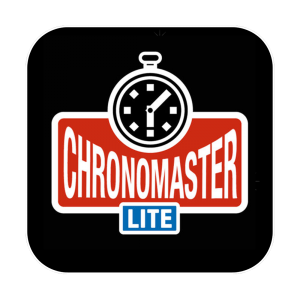 ChronoMaster will quickly become an indispensable companion for all your classic-rallying, can helop to drastically improve your results and render expensive rallye-computers obsolete. 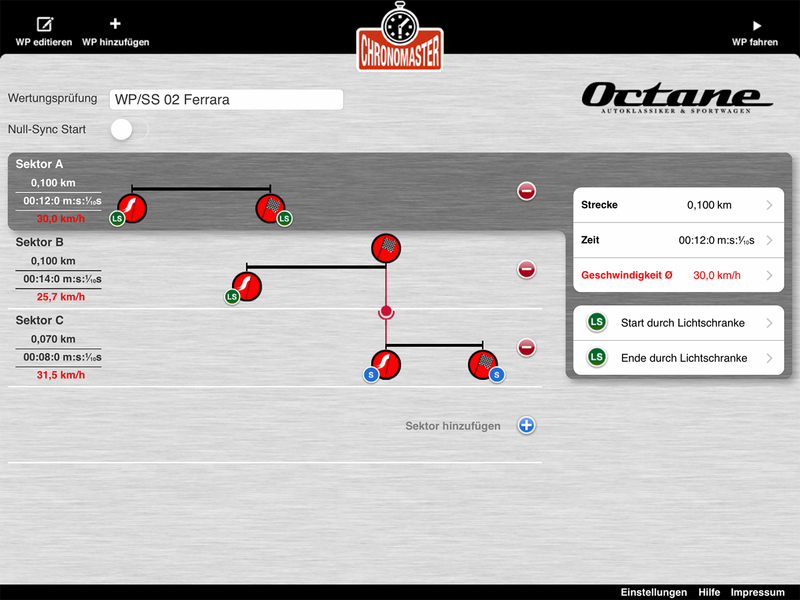 On top, ChronoMaster is highly intuitive and provides a better overview about your Special-Stages (SS) due to its large and bright screen which shows Special-Stages (SS) in almost the same way as in the roadbook. As a result you enjoy more control over how you drive a Special-Stage (SS). Enter Special-Stage (SS) – individual sectors of the SS can easily be moved left/right with your fingertip to match the depiction of the roadbook. Just copy the Special-Stage (SS) from the roadbook to your iPad. 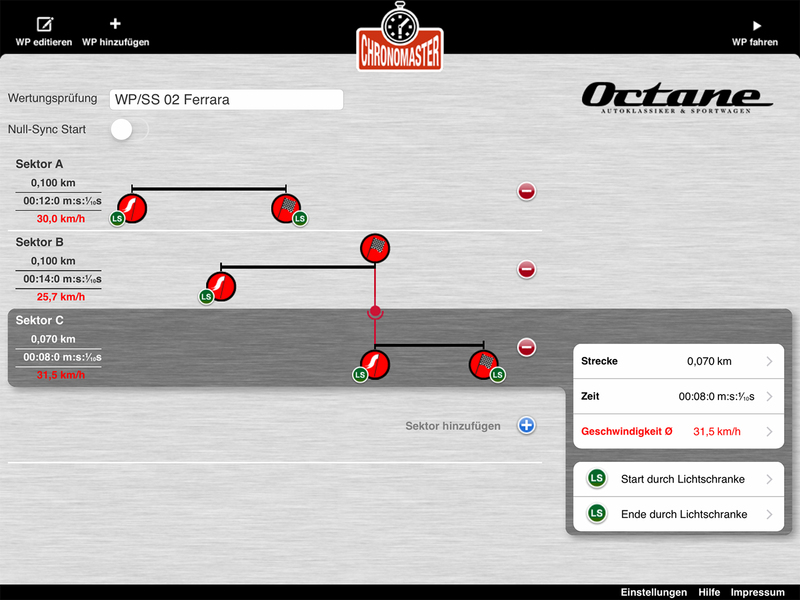 Input the name of the SS from the roadbook – this way you can easily find back the SS during rallying. 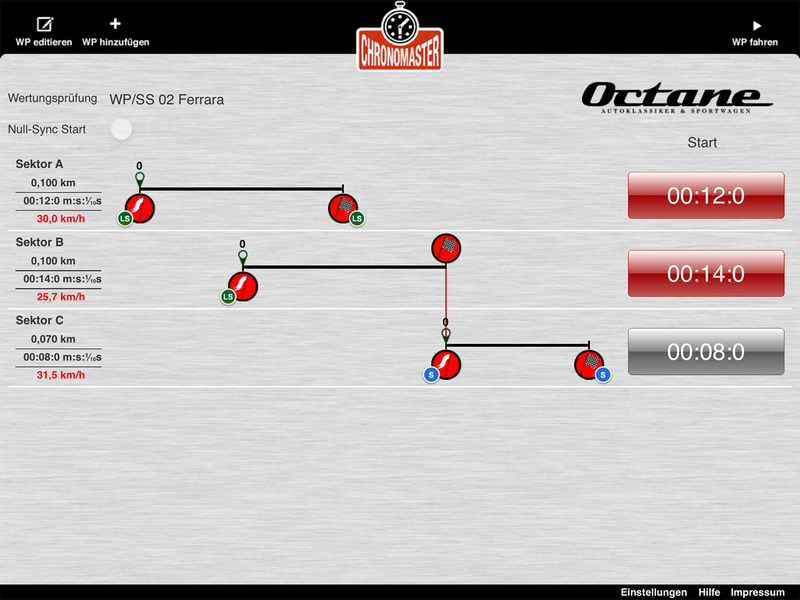 The first sector of the Special-Stage (SS) is already input with a distance of 100m in 10 sec. Change these values to match the SS as indicated in your roadbook. The average speed of the SS as a result of distance and time is shown in red and calculated automatically by ChronoMaster. Should your Special-Stage (SS) or sector require to enter an average-speed value instead of time/distance, simply edit the average-speed to the desired value and the resulting distance or time will be calculated automatically. All manually entered values will be displayed in black, any automatically calculated value in red. Select “Light Barrier” or “Pressure Hose” for start and finish of the sector as indicated in the roadbook. Start and finish can be selected individually. If your Special-Stage (SS) is made up of more than one sector you can easily add more sectors in ChronoMaster. Enter the values for distance, time and/or average-speed from your roadbook. As soon as you have entered the values you’ll recognize that the length of the distance-bar in ChronoMaster changed – however, sector B is still beginning at the same time as sector A. You can now easily move the distance-bar left/right with your finger until the SS on the iPad screen looks similar to the picture in the roadbook. Continue with additional sectors in the same way. In Special-Stages (SS) that are composed of multiple sectors, the finish-line of one sector often is identical to the start of the following sector. In reality this means that the light-barrier/pressure-hose that finishes one sector automatically initiates timing for the following sector. ChronoMaster lets you easily map this in the app and even lets you fully automatize it as a “Sync-Start”. Click the now red connector symbol again. The connector symbol is now changing to show that sector one and two are now connected in “Auto-Start/Sync-Start” mode. That way, timing for the second sector will start automatically as soon as timing for the first sector is finished. Provided you finish sector one exactly in time (i.e. crossed the light-barrier/pressure-hose in time), timing for sector two will start exactly in time with no need for you to do anything. In case you are unsecure if you will finish sector one on time or would still want to manually start sector two, you should not connect the sectors to “Auto-Start/Sync-Start” mode but start the second sector manually by pressing the start-button upon crossing the finish/start line. Experience with ChronoMaster, however, indicates that “Auto-Start/Sync-Start” will provide best results in most cases! A Special-Stage (SS) can be a combination of up to ten sectors which can be interlaced and nested into each other exactly as shown in your roadbook. ChronoMaster makes it easy to move single sectors around on your iPad screen, link sectors for manual or “Auto-Start/Sync-Start” operation and display your Special-Stage (SS) visually almost identical to the drawing in the roadbook. In some cases, you may be required to start multiple sectors of a Special-Stage (SS) at once upon start of a Special-Stage (SS) to initiate a synced timing-start of more than one sector. ChronoMaster allows you to do this as well. Simply check the “Zero-Sync-Start” checkbox when entering or editing a Special-Stage (SS). All sectors that you want to start at the same time upon start of the Special-Stage (SS) will then be started simultaneously with the press of just one start-button. All Special-Stages (SS) entered into ChronoMaster can easily be edited, amended, changed or deleted. Simply select the Special-Stage (SS) from the list and make the changes you want. Individual Special-Stages (SS) can be deleted or moved within the list by clicking onto the “Edit” button. It’s rallye time! 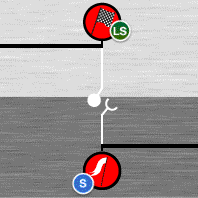 To drive a Special-Stage (SS), select the (SS) from the list. ChronoMaster will show the Special-Stage (SS) and all its sectors on the iPad screen exactly as you have entered it from your roadbook. In driving-mode a red start-button indicates the target-time of each sector. Grey buttons indicate that a sector is linked to another sector via “Sync-Start” and will start automatically. Start timing for the first sector when crossing the light-barrier or the pressure hose. The target-time will be counted down to 0 – means you will always be shown the remaining time to finish. HOW TO SECURE A PRECISE START: To ensure utmost precision of the starting process, try a “lift to start” mode instead of the “press to start” mode you might be used from tradtional stop watches. Simply put your finger on the red start-button and lift it when you pass the light barrier/hose to start timing, instead of “pressing” the red button to start. Should you need to take your finger off the startbutton without releasing the timing, simply move your finger outside the red area before lifting it. Once started, you will see an indicator moving from left to right along the distance-bar of each sector, indicating the distance that you should have covered, would you be driving at exactly the required average speed of the sector. You can easily check this distance with the distance shown in your tripmeter to drive exactly on average speed should you decide to do so. As soon as you are approaching the finish-line of a sector and come within 10 seconds distance of finishing, ChonoMaster will count down the remaining 10 seconds to 0 via its built in speaker – or even better via any attached headphone. 0 is indicated by a beep – this is exactly when you should cross the finishing-line. You can start any sector of a Special-Stage (SS) in the same way. Timing of each sector will run independently from the other sectors. Should the audio countdowns of two sectors overlap (in the unlikely event of the finishing-lines of two sectors being closer than 10 seconds), ChonoMaster will always preference the sector that will finish first and you will hear the audio-countdown for just this sector. This way you can fully concentrate on the next finish line – ChronoMaster will then switch to audio-countdown of the next sector automatically. If two or more sectors of a Special-Stage (SS) are connected, only the start-button of the first sector is active (red). All subsequent start-buttons are inactive (grey). You can therefore not manually start a sector when passing the finish/start line. However, timing of the sector will start automatically as soon as the countdown for the previous sector is finished and you cross the finish-line of the sector. Give it a try and find out for yourself if you prefer manual start of the next sector in finish = start situations. From experience, most users prefer the Auto-Start/Sync-Start setting over the manual start. You can change the mode at any time before driving a Special-Stage (SS) via the “Edit SS” command. You can abort countdown of a Special-Stage (SS) at any time. Please be aware that you can not continue the SS after aborting but must go back to the start of the SS! Start-Buttons can be positioned for left- or righthand use. Should you accidentally terminate the ChronoMaster app during a rallye or even in the midst of driving a Special-Stage (SS) – don’t panic! ChronoMaster will continue to run in the background and even the timing of a started Special-Stage (SS) will continue! Just restart ChronoMaster to continue. However, try to avoid terminating the app during driving a Special-Stage (SS). We are classic-car enthusiasts – probably just as you are – and have put all our experience of many years of classic rallying into this app. Still there may be things that you may not (yet) find in this version of the app and you would like to see in later versions. We are always open for suggestions and appreciate your feedback to chronomaster@gokd.net. And don’t forget to check out & like Chronomaster’s Facebook page for most recent announcements and tips!